Call of the Valley is a 1967 Hindustani classical music album by Hariprasad Chaurasia, Brij Bhushan Kabra, and Shivkumar Sharma. It was recorded for the label EMI.The instrumental album follows a day in the life of an Indian shepherd from Kashmir. It is one of the most successful Indian albums and one that became popular with an international audience. It was very important in introducing Indian music to Western ears and internationally the best selling Indian music record. George Harrison, David Crosby, Paul McCartney, Bob Dylan and Roger McGuinn are fans of the album.The atmospheric music is traditional, but the innovative use of guitar and flute make the sound more acceptable for Western audiences. Kabra plays slide guitar, Sharma santoor and Chaurasia bansuri. The artists became well known musicians and the instruments they used became acceptable in traditional Indian music. Today Call of the Valley is considered a classic and a milestone in world music. Allmusic advises: "If the newcomer buys only one Indian classical recording, it should be "Call of the Valley". "The remastered edition has three bonus tracks.It is listed in the book 1001 Albums You Must Hear Before You Die by Robert Dimery and Michael Lydon. 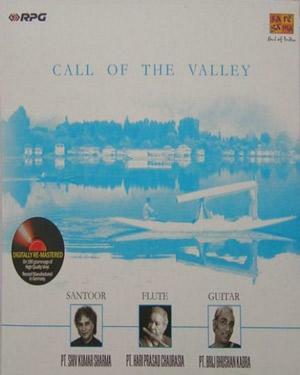 Original Call Of The Valley-Classical Vinyl released by SAREGAMA comes in 1 disk Vinyl pack. While processing the order, we bubble wrap the Vinyl in its original packing and send it in sealed plastic or carton pack. We don't offer download of the Music Call Of The Valley-Classical, nor we send free poster of the Music along with its Vinyl order. We also don't offer free wallpaper or song download of the Music. Poster and other accessories of the Music can be purchased separately. Buy Hindi Vinyl Call Of The Valley-Classical and watch them at the comfort Of your own home. Online shopping Call Of The Valley-Classical Vinyl, Buy Call Of The Valley-Classical Vinyl, purchase original Hindi Vinyl of Call Of The Valley-Classical. Online store to buy Call Of The Valley-Classical Vinyl	, online Vinyl store india, buy Hindi Vinyl, watch Hindi movie Call Of The Valley-Classical videos online. We don't offer Vinyl renting for Hindi movies online, Buy Original Call Of The Valley-Classical Vinyl @ discounted and cheapest price online in India.